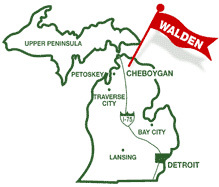 For this season, Marching Band Camp will once again be taking place at Camp Walden in Cheboygan, MI. (www.campwaldenmi.com). This year camp will be taking place from Sunday, August 11th though Saturday, August 17th. Chaperone Meeting (Camp Chaperones only): Friday, August 9th at 7:00pm in the Eisenhower ECC. We will being going over all procedures, forms, itineraries, and lots of other important information involved with the chaperoning process. Departure for Camp: We will be leaving for camp on Sunday, August 11th at 1:00pm on chartered motor coaches. Please see the arrival time sheet located below to find out when your child should arrive at Ike that day. You will enter Eisenhower through DOOR #13 which is located on the south side of the building by the Auxiliary Gym (It is tucked back and can be difficult to see, however we will have a sign outside). From there you will be directed to the Camp Staging Area in the “New” Auxiliary Gym for baggage inspection and loading directions. No one is allowed back in the Commons/Blue Hallway area without specific permission as we do not want people all over the building. We ask that only necessary camp personnel go into the Band Room that day as well. End of Camp Show: Saturday August 17th on the Eisenhower “Big” Football Field just west of the school. The approximate time will be 4:45pm (traffic dependent) following the approx 4:10pm return from Camp Walden. The estimated show length is about 20 minutes. Parking Info: Buses will be parking/unloading at the front, north west corner of Eisenhower. We are asking any parents who are picking up students to please park in the large front parking lot on 25 Mile as it will make carrying luggage easiest for you! For people just coming to watch the show we ask you to please park in the South Parking lots behind Ike or at Malow Junior High. Unloading Info: Students/parents should get their luggage off the bus quickly and take it immediately to your vehicle. Following that, all students should please report directly to the Main Gym (side closest to the track) with their instrument/pertinent show equipment for warm-up and to take our Football Yearbook picture. Cases can be left on the track up against the fence or in your car. Band members please be as efficient as possible since we’d like to get the show started quickly! Show Clean-Up: All members of the members of the band are expected to help assist in the tear-down of the field and unpacking of the trailer. The more we all help the faster we all get to go home! Camp Mailing Letter 2019 – This letter was mailed to every family in the ensemble using the self addressed envelope each student filled out at Home/Pre-Camp. What to bring to Marching Band Camp – A list of packing items/guidelines for the week of camp. Camp Rules and General Info 2019 – The basic rules and guidelines of Marching Band Camp. MB Camp Check In-Itinerary 2019 – Schedule of all the events for camp week. Times for check in/departure are included as well.